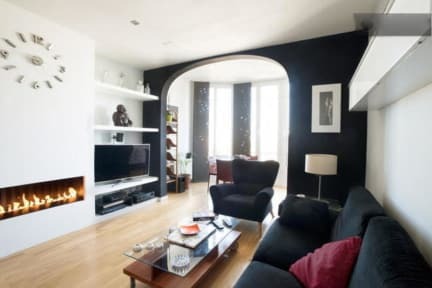 Al @ Rooms is your apartment in Barcelona, with 3 bedrooms 1 single and 2 double rooms for rent in the center of Barcelona. The renovated apartment with a lot of light, is fully equipped with air conditioning, satellite television, high speed wireless internet and telephone (national calls only). It has a video surveillance camera system in public areas of apartment for safety reasons. The apartment is very well located at one of the main streets of Barcelona: Gran Via, with the metro and bus station in the front of the door. The bus to the airport leaves at 150 metres and brings you in 10 mins to the airport. Check in: from 12:00 Please advise your approximate arrival time. Check in possible until 23:00, afterwards you will be charged an additional fee of 20 €. Tourist Tax is not included in the price 0.75€ per persona per nightIn the event that the client upon arrival, the number of travelers in the reservation exceeds the number allowed in the room, only the person admitted to the room will be allowed.